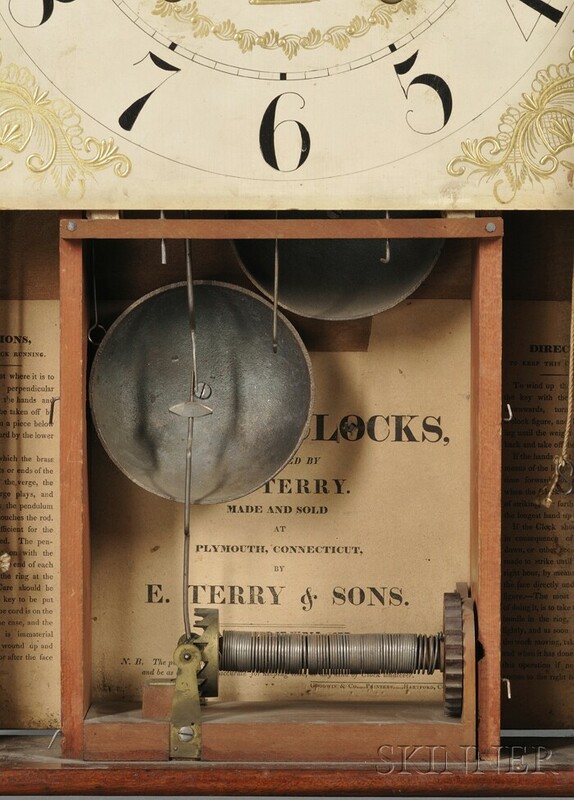 Eli Terry & Sons Mahogany Alarm Shelf Clock, Plymouth, Connecticut, c. 1825, full-length door with looking glass in the lower section, wooden dial with Arabic numerals, raised gilt spandrels, center with basket of flowers and gilded garland, engraved silvered brass alarm setting disc, printed maker's label inside backboard stating Patent Clocks invented by Eli Terry Made and Sold at Plymouth Connecticut by E. Terry & Sons, thirty-hour time, countwheel strike and "window shade" alarm mounted on the bottom board of the case, ht.22 1/2 in. Provenance: Donald C. Dean Collection. Literature: The present clock is illustrated in Brooks Palmer, Book of American Clocks, plate 190; this rare form is illustrated and discussed in Kenneth D. Roberts and Snowden Taylor, Eli Terry and the Connecticut Shelf Clock, 2nd revised edition, pp. 110-12. No significant condition issues, small corner cracks on original looking glass and clear dial glass, label, dial, movement are pristine, appropriate replacement tin weights with integral wooden pulleys, lacking eschutcheon.